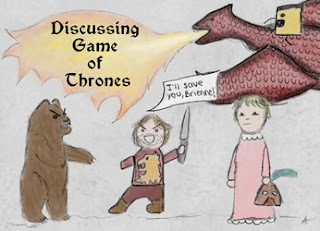 Extra Stern Spoiler Warning for “The Rains of Castamere:” A LOT of big stuff went down in this episode, so if you have not seen it or read the books, you'll probably want to avert your gaze from this recap starting now. Ouch. My heart still hurts from this one. I knew this episode had to come sooner or later, but I was still totally shattered after watching it. Reading about the events depicted in this episode in the books was one thing, seeing them play out on the television screen was an entirely different experience. I just wanted to have a good ugly cry after watching this. Most of this episode centered around the Starks, and aptly so, but we did get to see Sam and Gilly briefly, and Daenerys won an important victory in Yunkai. FYI to Daenerys: I’d choose Ser Jorah over Daario any day. The Hound poses as a pig farmer so he can gain admission to the wedding at the Twins, and Arya is supposed to pretend she’s his daughter. She’s none too happy about that, and she’s really not happy when he reminds her of what Ser Ilyn Payne did to her father. Arya informs the Hound that one day, she’s going to put a sword through his eye and out the back of his head. Hodor and Rickon Say the Most Lines . . . Ever! Hurrah for Hodor and Rickon finally getting more than a line of dialogue a piece! All right, so Hodor only said “Hodor” a ton of times, but still! Rickon was too heartbreaking—I almost cried when he told Bran he had to take care of him. I also nearly ended up in tears when the brothers said goodbye to each other and when Osha told the Reeds to look after Bran because he meant the world to her. I’m getting the sniffles just remembering all of those poignant scenes. Orell Was Right All Along! Jon was always loyal to the Night’s Watch! Hurrah! The look on Ygritte’s face when Jon said it—not one she’d ever want to see a photo of, that’s for sure. Before this recap heads into very, very somber territory, I’d like to remember the single scene that made me laugh: the expression on the Blackfish’s face when he noticed some of the female Freys trying to catch his eye and how he immediately returned to watching the wedding ceremony. The Starks were thisclose to reuniting: Jon fought the Wildlings right outside the tower where Bran and Rickon were holed up; the Hound got Arya to the Twins—where Robb and Catelyn were—just in time for . . . . The. Red. Wedding. The three most dreaded words in the world of A Song of Ice and Fire, at least for me. Even having read the books and expecting it didn’t soften the blow of watching it in any way whatsoever. In fact, I think watching it was even worse than reading about it. Catelyn begging Walder Frey to spare her son’s life; Robb watching his wife die in front of his eyes; Arya witnessing Grey Wind’s fate. All while that despicable Walder Frey reveled in the bloodshed. And do not get me started on Roose Bolton’s treachery! May he die the most painful death possible one day. He might want to keep in mind one of my favorite quotes, from Lord Wyman Manderly in A Dance with Dragons: “The North remembers.” I hope the truly loyal houses of the North send their regards to you, Lord Bolton! Overall, this was one sucker punch of an episode. And it wasn’t even the season finale! That’s tonight! If the penultimate episode of the season was this epic, I cannot imagine what’s in store for the last one. From the preview of “Mhysa,” it looks like we’ll be seeing just about every major character, and if the previous season finales are anything to go by, it should be an explosive hour of television. We’ll find out soon enough. Jon ~ Crows before Hoes...sorry Ygritte. Her face was pretty priceless. And...the Red Wedding...holy smokes! I needed a glass of wine to calm me down after that. Insane. I saw a hilarious Crows Before Hoes meme the day after the episode aired- with that shot of Ygritte's face, hahaha! I couldn't find the will to get off the couch for a good 15 minutes after the show was over. Too stunned and sad to move.